Click here to see the 2019 AGM minutes! Members, please add 19/1/18 to your diaries for the next AGM. Will be from 2.30-4pm in the Function Room of the Harlington as before. 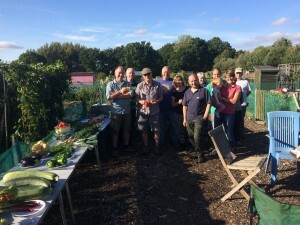 If there’s anything you’d like raised in advance for the AGM agenda please email admin@hart-allotments.org.uk by the time of the next committee meeting on November 26th – alternatively come along and raise it on the day. Thanks! Thanks to everyone who came along at the weekend - lots of communal jobs done and finished with a lovely social gathering and a good turnout of entries for the produce competition. Members, please add 20/1/18 to your diaries for the next AGM. If there’s anything you’d like raised in advance for the AGM agenda please email admin@hart-allotments.org.uk by the time of the next committee meeting on December 11th. Thanks! Due to the Fleet half-marathon on 19th March, Hitches Lane will be one-way traffic only with restricted access to the Pilcot site between approx. 10.00 am and 1.30pm. Probably best to avoid going to you plot until after this time – it’s quite early in the season so hopefully not a massive inconvenience!